The VLSI CAD Lab is headed by Prof. Malgorzata Marek-Sadowska. Located in one of the most scenic spots within the UCSB campus and with spectacular ocean views, the lab provides a prefectly calm and nurturing research ambience. Since its inception in 1990, many researchers including graduate students, research scholars, faculty and people from the industry have actively participated in lab's activities. Members at the VLSI CAD Lab have exhibted diverse research interests and have richly contributed to the field of Electronic Design Automation ranging from logic synthesis to manufacturing and more. Some of the most recent research activites are listed below. 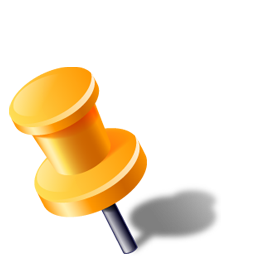 Can pin access limit the footprint scaling? 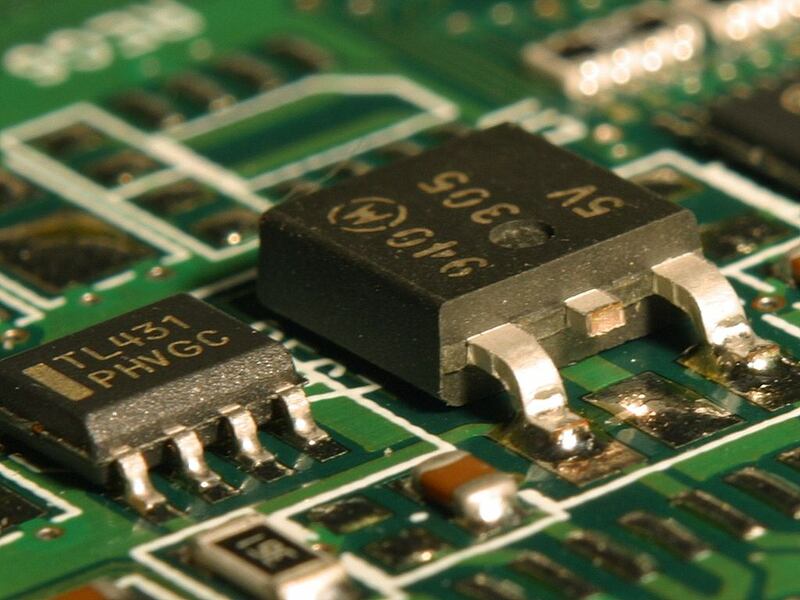 Electromigration (EM) reliability is becoming a serious problem for integrated circuit due to feature size shrinking. Interconnects, especially vias, in Power/Ground (P/G) network suffer from significant EM degradation as they carry large current. In this research, we study EM effect on P/G vias, considering uneven current distribution in via array and time-varying current loads. Our target is to detect hotspot via that is prone to EM failure and IR drop sensitive, and intelligently fix detected hotspot vias. Heterogeneous 3D chip with processor cores and cache blocks implemented in CMOS and NoC fabric in VeSFET technology shows significant improvements in all network parameters including latency, power, and energy consumption compared to other practical 3D NoC. Recently, CPU and GPU have been integrated in one chip. No exploration tool exists for studying a CPU+GPU, cache, and NoC together on 3D architectures. 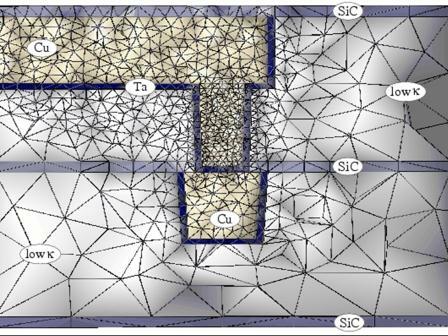 We are working on developing such a tool for 3D heterogeneous structures that will allow designers to quantify various architectural solutions from a physical design standpoint. VeSFET physical design: Vertical Slit Field Effect Transistor (VeSFET) is a novel twin-gate 3D device. VeSFETs are very attractive for low power applications because they have very small gate capacitance and extremely low leakage current. 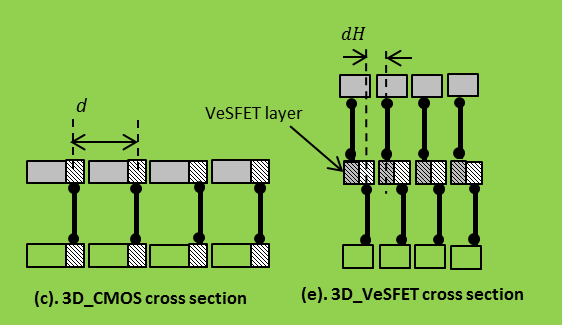 Layouts of VeSFET ICs are very different from traditional CMOS. 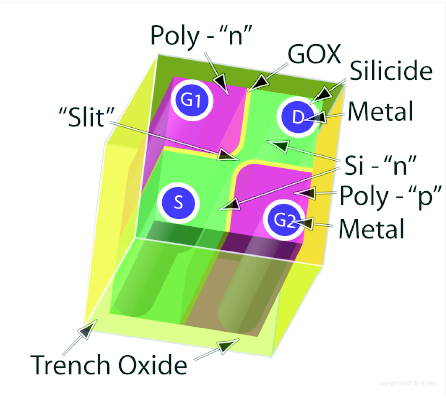 Transistors are packed into regular arrays with much higher density than CMOS ICs, leading to smaller footprint, shorter interconnects, hence higher performance and lower power. Currently, our research topics include VeSFET physical design (placement & routing), testing strategies and low power applications. Testing Analog Components in SoCs: Analog components in system on chip designs (SoC) have proven to be very difficult to test within the digital design verification flow. These components are simulated and verified using SPICE, which can be very time consuming for more complex components. We propose a machine learning method that will automatically create a behavioral System Verilog macromodel that removes the need for any SPICE simulation and can be tested using available EDA digital design tools.